Booknotes & Lincoln · Booknotes & Lincoln · One Book. One Author. One Hour. Brian Lamb and the C-SPAN team worked hard to ensure “Booknotes” covered diverse subject matters. But Lamb naturally has personal interests in certain topics, and these topics were often covered more frequently on the program. One passion is learning about President Abraham Lincoln. Lamb interviewed nearly a dozen authors about Lincoln. This in-depth analysis over a fifteen year period by such a prolific reader as Lamb provides insight into the President reveals how authors have researched and thought about Lincoln over time. Lamb’s interest in Lincoln had a profound influence in shaping the “Booknotes” program and C-SPAN. Brian Lamb was able to discuss this subject so frequently because Abraham Lincoln is a very popular topic for historians. Thus there are many well-researched and well-argued books released each year that analyze aspects of the President’s life and times from new perspectives. 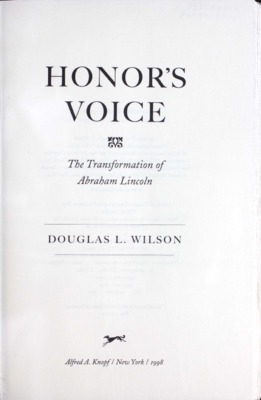 One such book was Douglas L. Wilson’s Honor’s Voice: The Transformation of Abraham Lincoln which appeared on “Booknotes” in March of 1998. Wilson, a professor and co-director of the Lincoln Studies Center at Knox College, analyzes Lincoln’s ascension from modest roots in the rural midwest to the Presidency. Focusing on the formative years of 1831 to 1842, Wilson argues that this rise to power had many challenges and highlights points in Lincoln’s early career which had the potential to derail the future President. Books dealing with Abraham Lincoln on "Booknotes" cover diverse topics. While Wilson studied Lincoln’s early years, others focus on Lincoln’s politics, ideology, or assassination. 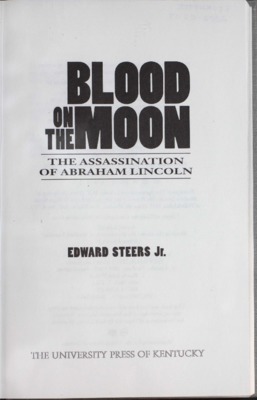 Challenging common narratives about Lincoln’s assassination and the plot by John Wilkes Booth and his fellow conspirators is the focus of Edward Steers, Jr.’s Blood on the Moon: The Assassination of Abraham Lincoln. Steers’ background as a research scientist provided him with a fresh perspective to analyze Lincoln's assassination and discuss the topic with Lamb on “Booknotes” in 2002. Author David Herbert Donald appeared on Booknotes on December 24, 1995 to discuss his book Lincoln. Like Lamb, Donald is a passionate Lincoln devotee. Here, Donald sits in his office, surrounded by materials and books about the sixteenth President, while a bust of Lincoln sits on his desk. When Lamb traveled to the biographer’s home he “discovered that Mr. Donald really does live on Lincoln Road in Lincoln, Massachusetts." In this 2014 oral history interview author Matthew Pinsker discusses his experience speaking with Brian Lamb in 2003 about his book Lincoln’s Sanctuary: Abraham Lincoln and the Soldier’s Home. It was clear during their "Booknotes" interview that Lamb was passionate and knowledgeable about the subject. Because of this Pinsker put a great deal of time into preparing for the interview. He also discusses how fortunate he felt to be chosen for "Booknotes." At the time he was a new scholar just starting out in the field. Lamb’s passion for Lincoln and his commitment to always ask new authors onto the show allowed many young scholars to get their start on this serious and respected program. 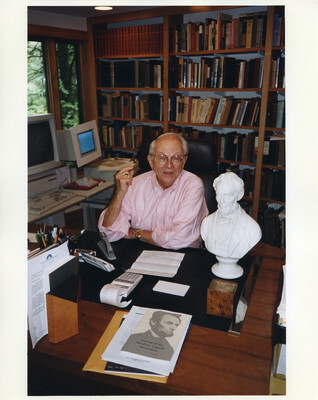 In his 2014 oral history interview author Harold Holzer discusses his experience speaking with Brian Lamb in 1993 about his book The Lincoln Douglas Debates. Holzer believes that his book and appearance on "Booknotes" helped to spark Lamb’s interest in the debates. In 1994 this interest culminated in a three-month event facilitated and aired by C-SPAN where historical reenactors presented the seven debates between Abraham Lincoln and Stephen Douglas during the 1858 U.S. Senate race in Illinois in their entirety.